There was plenty of talk about "supporting the troops" this year. Major newspapers referenced the vague phrase over 2,000 times in 2007 -- compared to about 3,100 references to General David Petraeus. Yet the holidays are a good time to literally support the troops. You can help our men and women in uniform by donating to USO, the non-profit organization that serves soldiers and their families. There was plenty of talk about "supporting the troops" this year. Major newspapers referenced the vague phrase over 2,000 times in 2007 — compared to about 3,100 references to General David Petraeus. Yet the holidays are a good time to literally support the troops. You can help our men and women in uniform by donating to USO, the non-profit organization that serves soldiers and their families. USO runs basic programs, like Internet and phone service to connect families and video recording enabling soldiers to read to their children while stationed abroad. 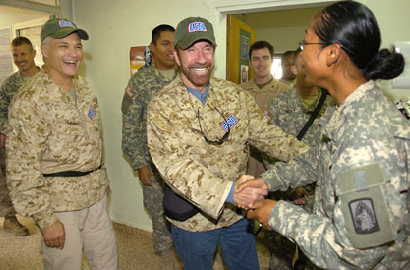 The USO also sponsors entertainment tours to boost troop morale — recent events have featured actor Chuck Norris, comedian Lewis Black and the rapper Paul Wall, who visited Iraq this August. In addition to donating to USO, Americans can also send letters to soldiers through the Defense Department’s message center.